We went to look at sports cars. You can do this sort of thing when you get to a certain age and are bored. When you’re younger, the sales person asks lots of awkward questions about why you want to change your car, and what your job is, so they can check you aren’t just messing about. But at our age, they simply ask what you currently drive (to check, I assume, a certain income level) and then they are happy to let you play, accepting that one of you must be having a mid-life crisis. We had been out for brunch at Marcos in Sevenoaks (best place locally for brunch) and drove down to the outskirts of Tunbridge Wells, where there is a whole road of car dealerships, so you can walk along comparing cars. 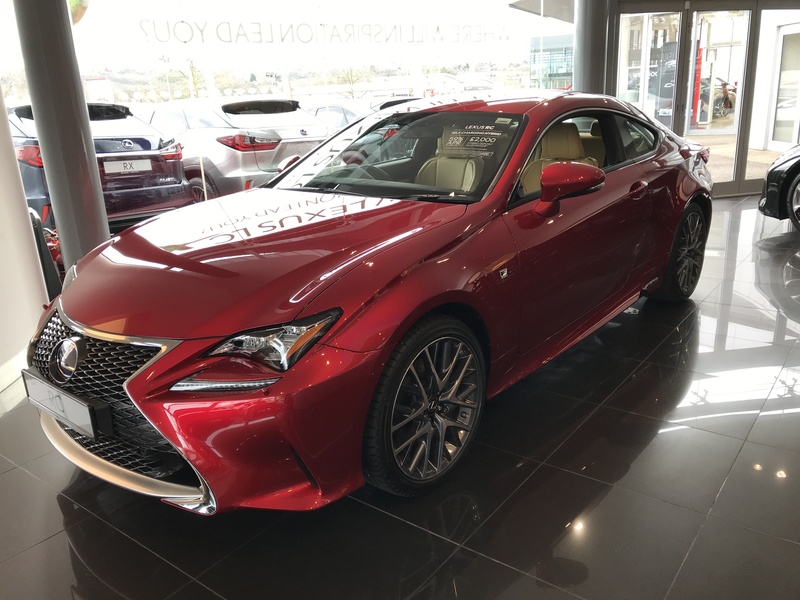 We started in the Lexus garage, looking at the LC 500. It’s a very pretty car. It has nice rounded corners, and lights which are shaped like slitty eyes, assessing the road. It’s very low profile, and hugs the ground (so would probably make it to the end of our driveway before it was stuck in a pothole, but we’ll brush over that detail). It’s a hybrid, which Husband likes. 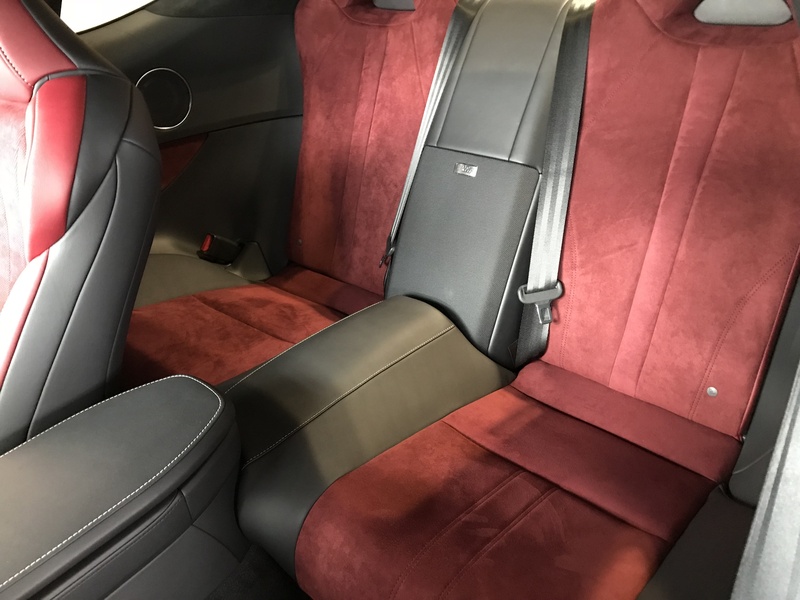 Inside, the seats were leather, with suede trim. 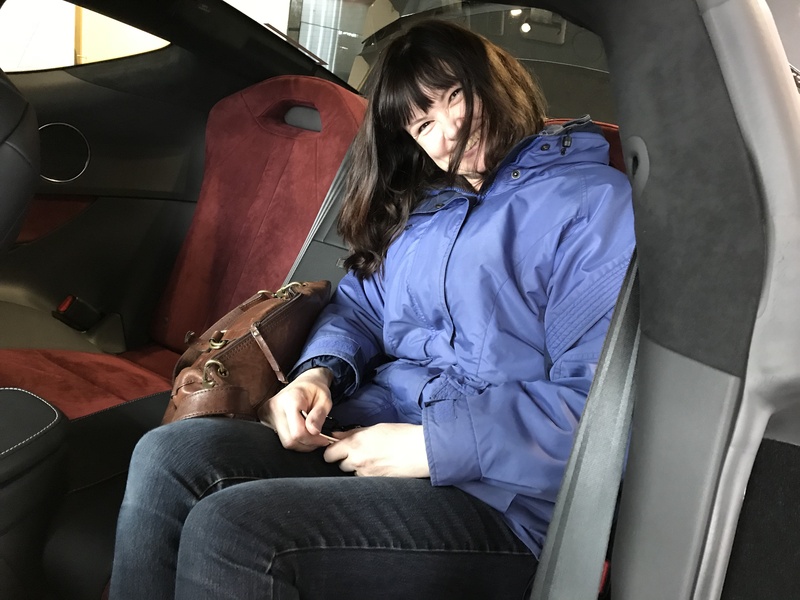 They were very comfy to sit in, though a long way down, so I might need old-person grab handles in a few years to get out of it (if I ever gave my mother a lift, she would need to be hauled out of the seat when we parked). Very pretty, but I wasn’t sure it would be very practical with a dog. In fact, I was a bit unsure about the dog altogether. I checked the boot. Checking the boot took longer than expected, as we couldn’t work out how to open it. There was no handle or obvious catch, so Husband checked inside the car. No clever levers or buttons there either. Eventually, I found a tiny round button next to the left rear light, which opened the boot. The cover slid elegantly back – and we both laughed! The boot was tiny. Really tiny. There was no way we could squash a German shepherd dog into it, or even a suitcase actually. 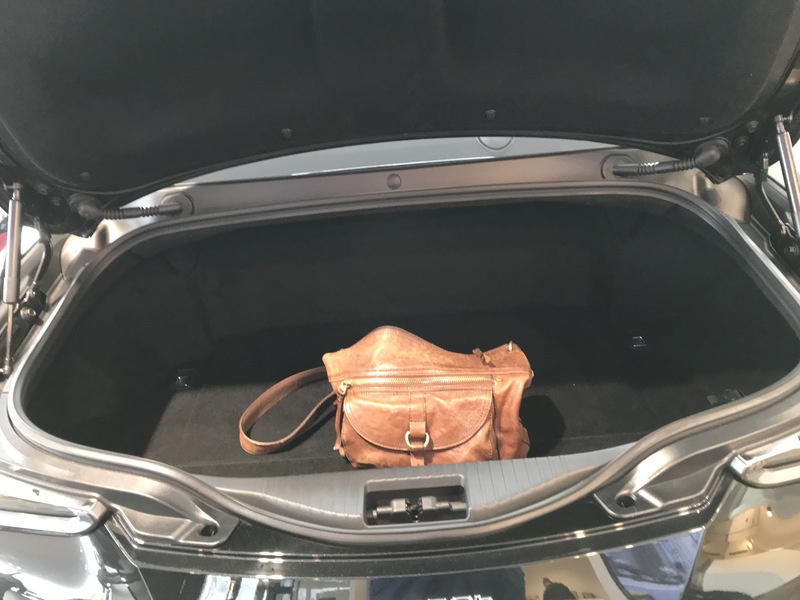 Husband assured me this wouldn’t be a problem, as when we go away for the weekend, we could pack our clothes straight into the boot. I had visions of sneaking through hotel reception with pockets stuffed with socks and underwear. The boot did, to be fair, comfortably fit my handbag. We were now on a mission – where could the dog travel? There was no room in the passenger footwell, as the dashboard curved over it. Perhaps the back seat would be the best place (if one didn’t think about muddy damp dogs ruining suede). We moved the front passenger seat forwards, with the rather swish mechanism that raised the seat and then slid it forwards while we watched. We stared at the back seat. It didn’t have much (any) in the way of leg room, but dogs don’t exactly put their feet on the floor when they travel, so that wasn’t a problem. However, the height from seat to aerodynamically designed roof seemed quite small. I slid into the back seat (not as smoothly as the mechanics had slid the front seat forwards) and tried to sit upright. I couldn’t, not without bumping my head on the ceiling. An adult would have to travel on the back seat with their neck bent. This is the sort of thing my children make an unreasonable fuss about, so we wouldn’t be giving them a lift anywhere. I wasn’t quite sure of dog’s height when sitting, but I had images of lolling tongue very near the back of my head while we drove. We gave up on the LC 500 as a viable car, unless we left the dog at home. If you have lots of money to spare and either very small children or a very small dog who never gets dirty, this is the car for you. We had a quick look at the Lexus RC, which is smaller and cheaper, and has a bigger boot. Then we wandered down the road. We looked at the Nissan sports car, but couldn’t sit in it as the showroom model had been bought. It wasn’t as pretty as the Lexus LC, cost about the same, and had no more boot room. We popped in to Toyota and Mazda too. But to be honest, I’d lost enthusiasm by this point, and all the cars were beginning to merge into one, so we went home. Thank you for reading. Have a good week. Anne E. Thompson has written several novels and one non-fiction book. What a fun read this is!